All councillors supported the report unanimously even after a bit a politicking on an amendment proposed by Cl. Meggs. The amendment was to defer a proposed barrier on the Adanac bike path on Union at Gore to east-bound commuter traffic in response to concerns that were raised by area residents. The deferral for one month is to allow engineering staff to do more consultation and develop the design a little more. 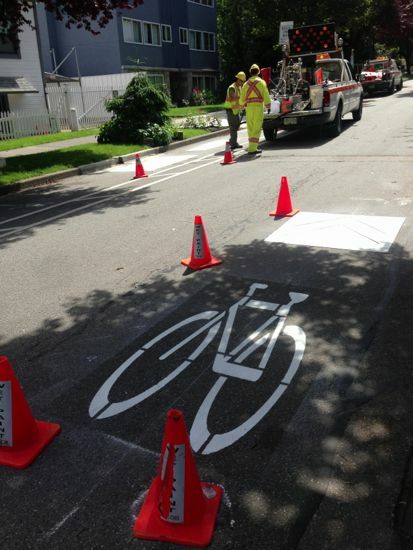 Councillor Affleck proposed an amendment to stop all work on the Adanac bike path on Union for a month, but it was not support by the majority on council. Then he requested that Cl. Meggs’ motion be removed from the main motion to be voted for separately by Councillors. Then curiously he voted for the amendment. Then on twitter he stated the following. It seems kind a strange to vote for a motion and then try to claim that your political opponents ramming a measure through! Sadly, the NPA is deliberate attempting to politicize attempts to create safer conditions for people riding bikes and to create a more sustainable transportation system in Vancouver. The good news is after listening to a speakers list of over 14 people, speaking both for and against the plan, council approve $2.9 million in upgrading for new cycling infrastructure. Categorized under: active transportation, Vancouver City Council. Tagged with: 2040 Transportation Plan, Adanac Bike Path, Cl Affleck, Cl. Meggs, NPA. ← Interested in creating better consultation practices in Vancouver?